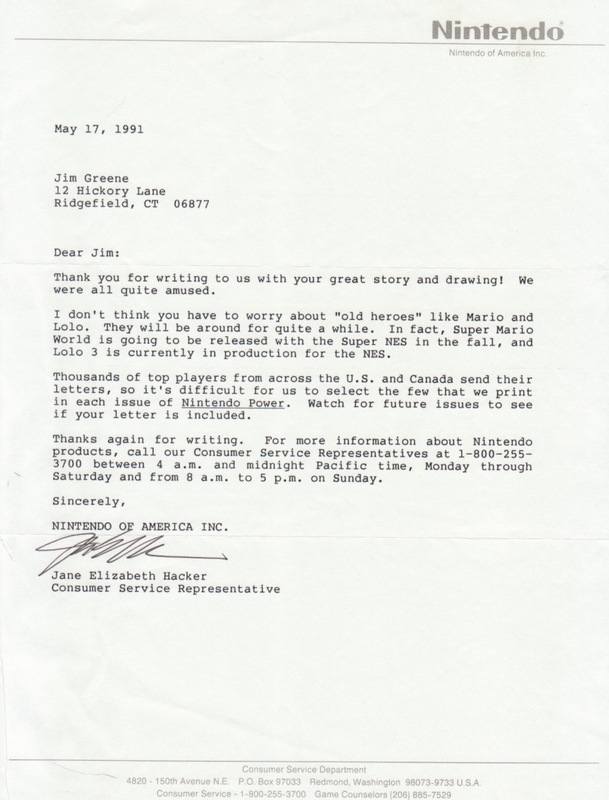 Another Letter Of Note | JG2LAND: THE OFFICIAL BLOG OF JAMES GREENE, JR.
1991: The year punk broke, and also the year the Nintendo Company rolled out their sixteen bit video gaming system—creatively titled Super Nintendo. Several months ahead of the August release date I caught wind that game cartridges from the regular Nintendo system would not be compatible with this new console. I want to say I felt nothing but white hot rage over this development, but cranky depression would probably be a more accurate assessment of my feelings. How could I get on board with SNES when it would instantly render my pre-existing game collection obsolete? Well Jane, you were on the money about Super Mario’s longevity, but for poor Lolo “quite a while” turned out to be roughly one year from the time you inked those not-so-prophetic words. Not that I’m mad. I’m sure you had nothing to do with our blue mouthless friend’s disappearance from the pop culture landscape. I can at least respect you for being so upfront about the fact my letter would probably never grace Nintendo Power’s sacred glossy pages. It didn’t, and that’s okay. The head of the design team for the original NES, Masayuki Uemura was again commissioned as the architect for the new console. President of Nintendo, Hiroshi Yamauchi asked Uemura that he explore the option of making the new 16-bit system compatible with the millions of cartridges they had sold for the 8-bit NES. He knew that cross-compatibility was a major factor in the success of a second-generation system. I’d never heard of this Super Eight accessory until two hours ago, which goes to show how quickly I drifted away from video gaming after SNES debuted. Doesn’t sound like it was so hot anyway—I mean, what good was the thing if you couldn’t even play Battletoads correctly on it?